Did you know that there is a Standard of Perfection for poultry being shown at any show including the county fair? The Standard of Perfection describes the defects or disqualifications which may automatically eliminate a bird from a show. 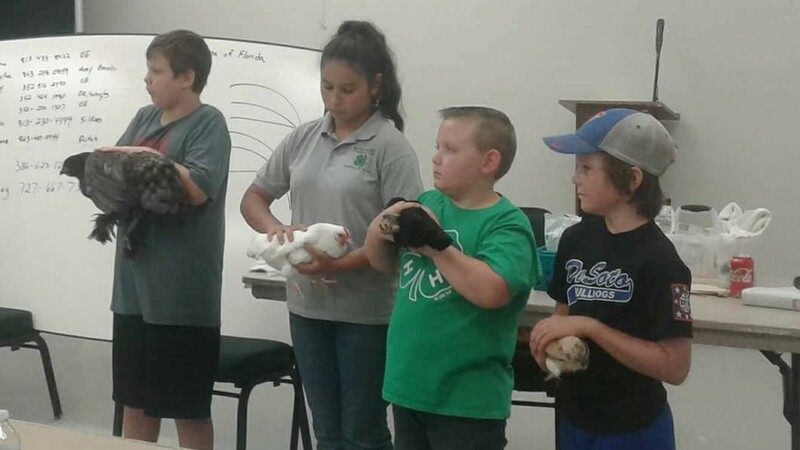 This is just one of the things that 4-H members learned while attending a Poultry seminar this past weekend. Mrs. Cindy Kinard, has been educating 4-H members about all aspects of the poultry project for many years. Each year, any child who plans on showing a poultry project at the county fair must attend a mandatory training. This training will include educating a child on daily care of their bird(s), how to groom or wash the bird, proper showmanship and much more. At this seminar, a large focus is on showmanship as this is the part of the show that the child is able to demonstrate their knowledge of poultry or their specific breed as well as their ability to handle the bird. In order to excel in showmanship, youth must take the time to train their bird in order for it to get used to the procedures during the show in order for it to stay calm. In addition, by practicing for weeks in advance, youth have a chance to improve their showing skills. Showing poultry is about more than just leaving the bird in the cage for the judge to look at. It requires you to practice, bathe and handle the chicken on a regular basis. You must pose the chicken appropriately for the judge to examine and you must know your facts! This seminar was a great opportunity for 4-H youth to do just that!